A bag of luffa fruits. ↑ ক খ The plant genus name "Luffa" was introduced to Western botany nomenclature by the botanist Tournefort in 1706. In establishing the Luffa genus, Tournefort identified just one member species and called it "Luffa Arabum". His 1706 article includes detailed drawings of this species (which is now called Luffa aegyptiaca) – Ref. The species is native to tropical Asia but has been under cultivation in Egypt since late medieval times. The botanist Forskal visited Egypt in the early 1760s and noted that it was called لوف lūf in Arabic – Ref. In the 18th century the botanist Linnaeus adopted the name luffa for L. aegyptiaca and assigned this luffa to the Momordica genus, and did not use a separate Luffa genus. More refs on Luffa in 18th century botany nomenclature: "A commentary on Loureiro's "Flora Cochinchinensis" ", by E.D. Merrill, year 1935, in Transactions of American Philosophical Society volume 24 part 2, page 377-378. Luffa @ ATILF ওয়েব্যাক মেশিনে আর্কাইভকৃত ১৭ অক্টোবর ২০১৩ তারিখে and "Suite de l'Etablissement de Quelques Nouveaux Genres de Plantes", by J.P. de Tournefort (1706) in Mémoires de l'Academe Royale des Sciences année 1706. 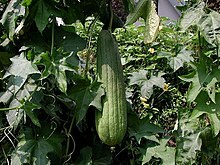 The earliest known record of name "Luffa" in English is in 1768 from the botanist Philip Miller, who ascribes the genus name to Tournefort, and uses Tournefort's species name "Luffa Arabum", and says "Egyptian cucumber" is a name used in English - Ref.